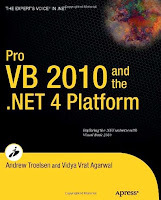 Pro VB 2010 and the .NET 4.0 Platform /by Andrew Troelsen, Vidya Vrat Agarwal. Be the first to understand .NET 4.0 and Visual Basic 2010. 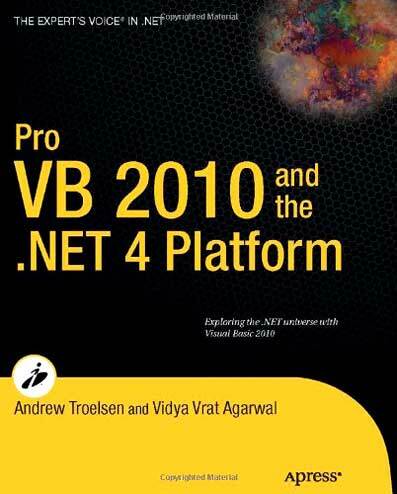 Pro VB 2010 and the .NET 4.0 platform provides developers with a complete guide to the new technology, explaining the importance of all the key C# 2010 language features. This new edition has been comprehensively revised and rewritten to make it accurately reflect the VB 10 language specification for the .NET 4.0 platform. You’ll find new chapters covering the important concepts of dynamic lookups, named and optional arguments, Parallel LINQ (PLINQ), improved COM interop, and variance for generics. The first edition of this book was released at the 2001 Tech-Ed conference in Atlanta, Georgia. At that time, the .NET platform was still a beta product, and in many ways, so was this book. This is not to say that the early editions of this text did not have merit—after all, the book was a 2002 Jolt Award finalist and it won the 2003 Referenceware Excellence Award.